With massive desert landscapes as well as huge stretches of man-made lakes, the Al Marmoom conservation reserve in Dubai is now being touted as the emirate’s next big tourism destination. Unveiled last year by the UAE’s Vice President and Prime Minister and Dubai’s ruler Sheikh Mohammed bin Rashid Al Maktoum, the massive project covers 10 per cent of Dubai’s total area. The first unfenced desert conservation reserve in the country, it spans more than 40 hectares of shrub land and is home to more than 204 species of native birds, 158 species of migratory birds, 26 species of reptiles, nine mammal species, and 39 species of plants. The area also encompasses 10km of lakes including the Al Qudra Lakes, and teh more popular Love Lake, which – according to officials – was developed within four and half months. 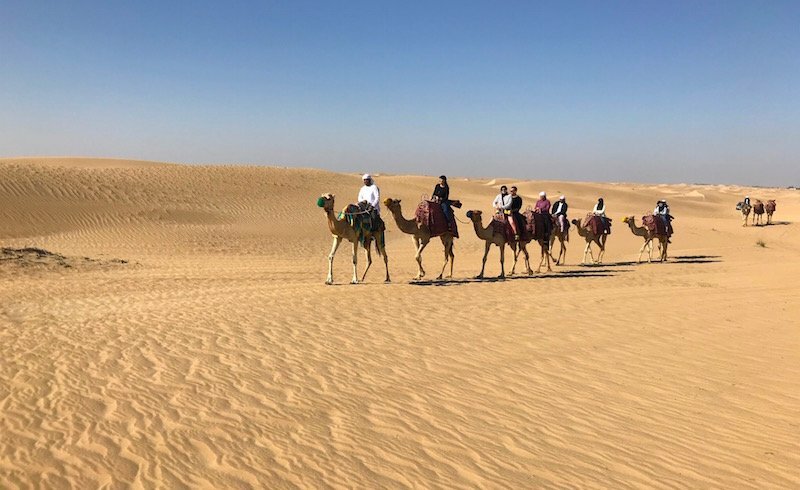 While the lakes are open and accessible to all visitors, Dubai Tourism has teamed up with a tour operator, Platinum Heritage, to offer tourists a feel of the traditional bedouin experience. With day and night packages, the tour includes elements such as a camel ride, falcon show and a Bedouin village experience. Here’s a video of the camp as well as the lakes that are main attractions on-site now. Looking ahead, the conservation reserve expects to have more such camps, as well as other facilities such as animal and bird observation platforms, areas for yoga and sports activities as well as an outdoor theatre.